A top Irish player of an online game died during a late-night mission at the Poolbeg lighthouse, an inquest has heard. Francis (Frank) Maxwell (48) Portacarran, Oughterard, Co Galway was playing Ingress, a reality game that captures landmark buildings or ‘portals’ for points when he died. 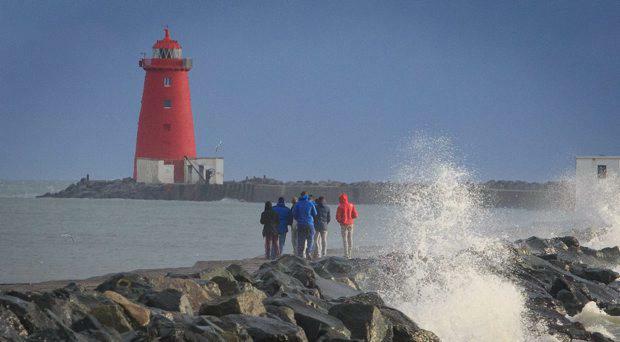 The dad-of-one, who was working in Dublin, was found in the water next to Poolbeg Pier around noon on September 25, 2015. He’d gone to the pier at 2.30am on a mission to redo some work undone by Ingress opponents. Team-mates say he checked in at the pier on Google Hangouts at 2.31am and remarked that it was cold. The night was clear and moonlit and the water was calm, Dublin Coroner’s Court heard. Mr Maxwell was not heard from again. Mr Maxwell’s wife Alma Joyce said he was one of the top Ingress players in Ireland who loved the game and talked about it often. He was a night-owl who loved driving, nature and the outdoors and was a ‘proud protective father’ to their son, Lucas. “Lucas brought him pure joy. He was a beautiful, intelligent, independent soul and he had a great laugh. Life is a living nightmare without him,” Ms Joyce said in her deposition. Detective Garda John Paul Marrinan said Mr Maxwell and others were ‘linking portals’ as part of the Ingress game at sites between Tyrellstown, Rockabill in Skerries and Poolbeg Lighthouse on the night of September 24, 2015. They completed their task by 11pm but Mr Maxwell went out to Poolbeg Pier later that night after an opposition team "undid some of their work". Det Gda Marrinan said Mr Maxwell may have tripped on raised grates for water run-off while walking along the pier and may have been looking at his phone. Garda Valerie Farrell said the raised grates had since been removed from the pier. The phone was never recovered. Poolbeg Lighthouse had been previously designated as a portal by Ingress players. Many portals are historic sites or landmark buildings and players must be within a radius of 20ft of a portal to carry out any activity associated with it. Dublin Coroner’s Court heard that the water tower on the M50 had previously been a portal but was removed because access was deemed too dangerous. Ms Joyce said her husband often played the game in her presence and wanted her to get involved. There were many portals around Oughterard, including her father’s home, she said. “The pier is open at both sides, the surface was uneven, it was night-time, there are no lights, it was in the course of this game Ingress,” the coroner said. Dr Farrell said he would write to San Francisco based game creator Niantic, Inc and Dublin Port Authority to inform them formally of the death.